When I started the blog, she was working in a reputed company in German language and loved to do makeup. Now, she works on German as a freelancer part time and is starting to work full time on makeup :). This all has become possible with your love and support only. When we venture into one thing and get good response, only then, we go a step forward and try out something new, the things that we could only dream of one day. Now that she has moved to Australia, she is much more willing to try on and work more towards her love for makeup. Though she will be doing makeups both in India and Australia. Let’s start the new year on a positive note with her 1stwork. 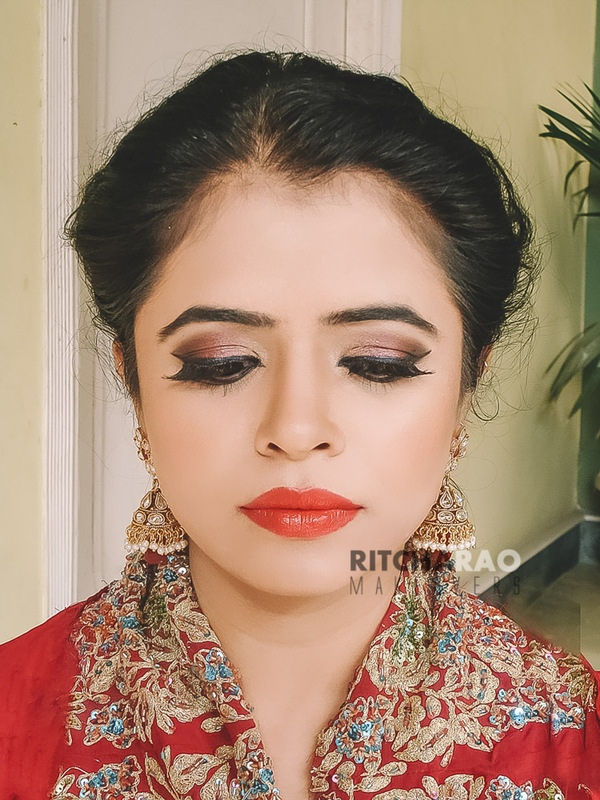 A bridal look done by Ritcha on Ritcha 🙂. Pour in your love, feedback and suggestions friends. Nothing is possible without your love. Do let us know if you want to see something specific. We will come up with more and more of makeup looks now 🙂. Wow! This is a gorgeours make up. Love the combination of colors! great makeup, i love it! Congrats Charu. Get going and get moving and I am behind you. Nice makeup to start off with the skills. Her skin looks flawless! I have only slight undereye bags which I want to hide. Can you do a video for that? How exciting! Much luck and success for both of you! I can't wait to see more! Wonderful news! Gorgeous makeup, she will do well!